Hope you all are having an amazing year so far. 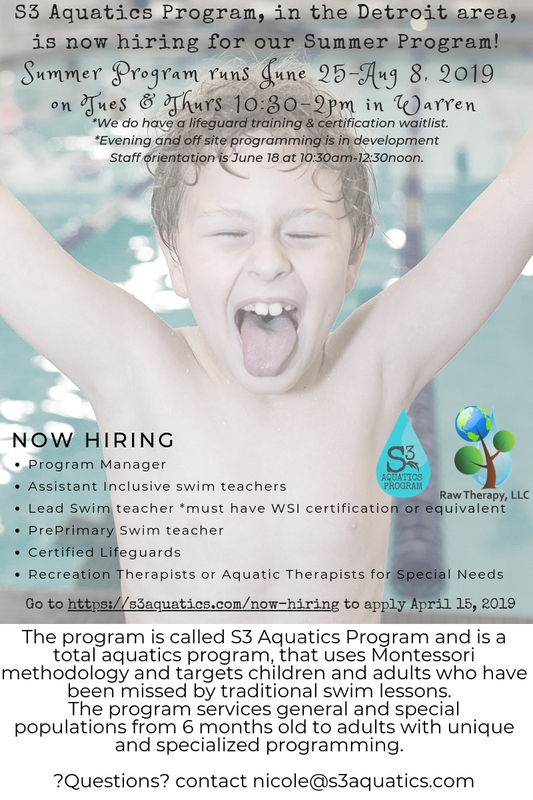 Letting you all be the first to know that we are now hiring for the summer program which will be held on TUESDAYS AND THURSDAYS from June 25-August 8 from 10:30-2 pm at Warren Woods Towers again. We will be having evening programming as well on Tuesday nights and off-site program in Lake Orion to be scheduled. We became a local partner with the USA Swimming Make-a-Splash initiative. USA Swimming Make A Splash Parent Resources There's so many resources here. Check it out. We have become an official partner with Four Corners Montessori Academy this summer. This summer we will be debuting our "MerMamas and Minis AquaFit" (ages 6-24 months) class as well as our dynamically designed and fantastically fun "MerKids Clinic" run by our Aqua Joanie aka: Mermaid Gypsy Hearth. For our advanced students, we will continue our "Montessori MasterClass" who want to explore pre-swim competition and lifeguarding. We will also be debuting our "Navy Seals Jr.-Land & Sea Bootcamp" for our middle school and high school students who enjoy taking on physical challenges. We will be debuting our rotating curriculum. In true Montessori fashion, Montessori has an odd and even year curriculum. This year we will keep our tenets of swim safety, swim skills and social play, but our focus will be on swim and water skills practical life allowing our students to explore water sports and activities. Our Community and Family Special event will be "Family Olympics". Ms. Nikki Delia will be back this summer as our Montessori Curriculum Consultant and Lead Teacher. She is so talented in both areas (I know, she was also my son's Montessori school teacher). Please refer to attached ad and reach out to be by April 15 if you are interested. Applications are posted below.